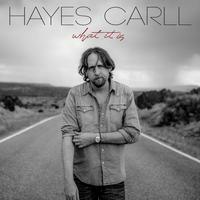 On What It Is, the Houston, Texas troubadour Hayes Carll is leaving the past behind. "I want to dig in so this life doesn't just pass me by. The more engaged I am the more meaning it all has. I want that to be reflected in the work," Carll says. The new album covers a broad range of topics both timely and constant; the desire to bridge the country's political divide, the ups and downs of relationships, and the challenge to stay present in your life as it goes by. What It Is continues the artistic risk-taking initiated by 2016's Lovers and Leavers; his voice is strong and assured, and his songwriting as truthful as ever.